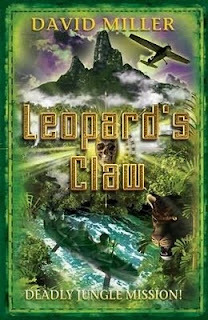 Leopard's Claw by David Miller. "BETRAYED. ATTACKED. LOST. Life has returned to normal for Hanna, Ned and Jik after their adventures in the tempestuous Sulu Sea. But then Dad heads to Borneo to look for gold and everything goes horribly wrong. Dad is accused of murder, and Hanna, Ned and Jik know they must go into the jungle to prove his innocence. It is a race against time but the tropical forest is filled with predators - both animal and human. And what deadly secret waits in the heart of the jungle?" I really enjoyed the first two books in this series, Shark Island and Sea Wolf, so I am very excited to read this! I'm not going to post the blurb again, as I've posted it several times already! 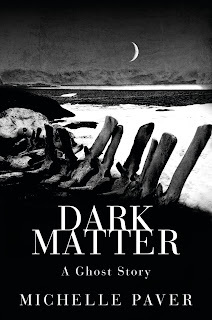 This week, I received a signed and dedicated proof copy of Dark Matter as a thank you from Michelle for all the work I do as part of the moderating team (called Clan Guardians) on the official website for her Chronicles of Ancient Darkness series. This made my week, possibly my year. The message inside was beautiful and made me extremely happy. I was on a high for a few days after getting it. 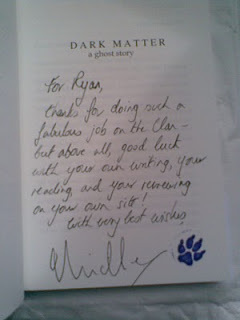 I cannot thank her agent, Peter Cox (Admin) and Michelle enough for this. I am so grateful and will cherish this for life! How was your week? Happy reading! Wow!! That really is amazing. Bet you were so excited!